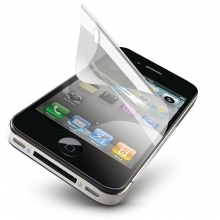 Protect your iPhone 5's screen from scuffs and scratches with this high-grade PET screen protector. The glossy finish offers an amazing visual clarity without affecting your capacitive touch-screen performance or retina display quality. Your iPhone 5 will still be great for all the same games, apps, web browsing and multimedia playback as it ever was, only now it can go into your pocket naked and you won't need to worry about screen damage. Easy to apply, this kit includes one (1) clear gloss screen protector and a microfibre cleaning cloth.